PRAGUE, Nov. 28 (Yonhap) — South Korean President Moon Jae-in and Czech Prime Minister Andrej Babis agreed Wednesday to further improve their countries’ bilateral ties and make joint efforts to prepare the countries for the fourth industrial revolution. In a meeting in Prague, they noted the countries’ relationship has steadily improved since the countries established diplomatic ties in 1990. “The two countries have steadily developed their cooperative relationship since establishing diplomatic ties in 1990, and their cooperative relationship has developed more rapidly since their ties were upgraded to a strategic partnership in 2015. I am very pleased with the development in our relationship,” Moon told the Czech prime minister. “But I believe the relationship between the two countries has a potential to develop further. I have hopes to further develop the relationship between our two countries together with the prime minister,” he added, according to pool reports. The South Korean leader arrived in the Czech capital Tuesday as part of a three-nation trip that will later take him to Argentina for the annual Group of 20 (G-20) summit. Moon and Babis stressed the importance of mutual cooperation in new, future-oriented industrial sectors, including information and communication technology and artificial intelligence, according to Moon’s presidential office, Cheong Wa Dae. The South Korean president called for increased cooperation in the nuclear energy sector. “South Korea is currently operating 24 nuclear reactors, and there has not been a single accident while it operated nuclear power plants over the past four years,” the president told Babis, according to his press secretary, Yoon Young-chan. Prague is said to be pushing to build a new nuclear power plant, worth some US$2 billion. Babis said he was well aware of South Korea’s advanced nuclear energy technology, also acknowledging the successful construction of South Korea-made nuclear reactors in the United Arab Emirates, Yoon told reporters. Moon also sought Czech support for his country’s efforts to peacefully denuclearize North Korea. 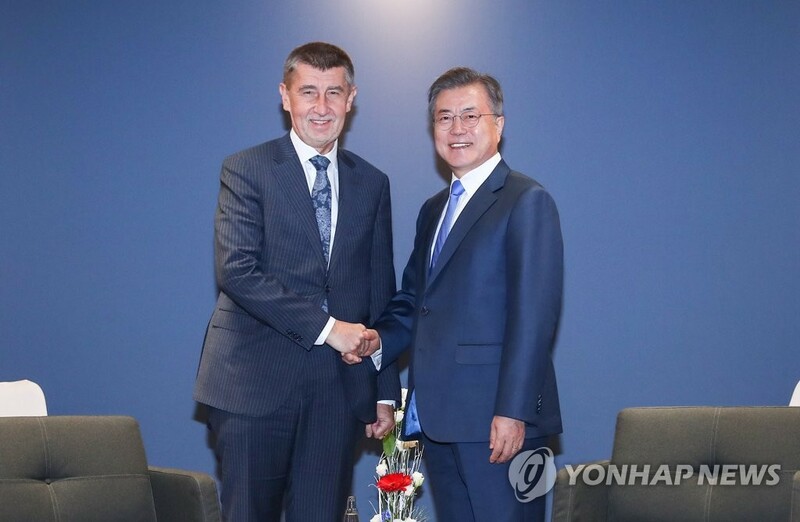 Babis said his country will continue to support Seoul’s efforts to establish lasting peace on the Korean Peninsula, Cheong Wa Dae said, noting the Czech Republic maintains a permanent diplomatic mission in the communist North. Meanwhile, Czech President Milos Zeman has sent a personal letter to Moon, expressing regrets for his failure to greet the South Korean president due to his ongoing trip to Israel, Cheong Wa Dae said. Moon will end his two-day visit to the Czech Republic later in the day to head for Buenos Aires, where he will be joined by the leaders of 19 other developed and developing nations for the G-20 summit that will begin Friday. He will make a state visit to New Zealand later in the week before heading home next Tuesday.